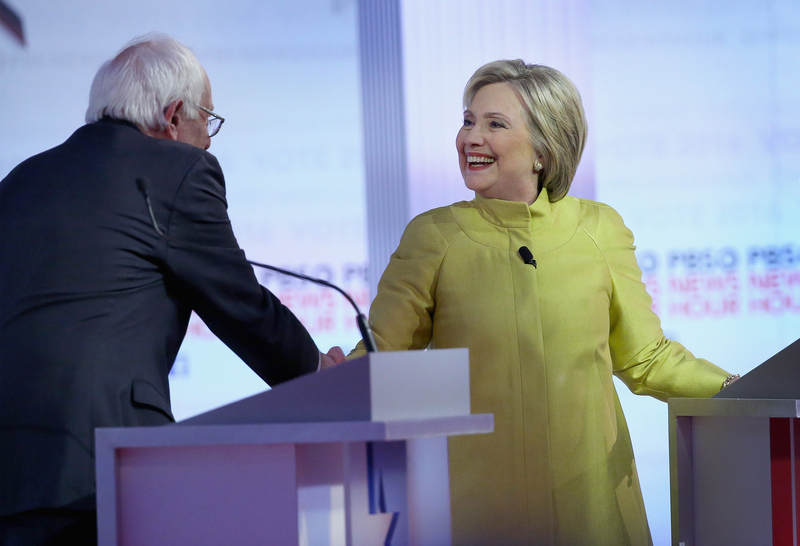 Thursday's Democratic debate was a remarkably more watchable forum than any of the ones that preceded it. PBS did an exemplary job as host, the moderators asked excellent questions, and the result was an informative, adult conversation about policies. Both of the candidates, as well as the Democratic Party in general, came out of the event looking great. For these reasons, the Democratic debate losers were the channels not named "PBS," because the publicly-funded broadcast just put all of them to shame. At this point, it's become a cliche to say that the Democratic events are more mature than the Republican affairs. That was indeed the case this time around, and while it's very tempting to chalk this up to the actual maturity gap between the two parties themselves, PBS deserves a whole lot of credit for how it handled this debate. Everything about it was classy, from moderator's questions to the quality of the live-stream to the physical stage itself, and the result was, well, an excellent debate. Let's start with the fact that this was the first presidential debate in American history to have an all-woman moderating team. While it's embarrassing that it has taken the country this long, PBS deserves applause right out of the gate for breaking that trend. As Clinton remarked, this meant that women (including candidates and moderators) comprised a majority of the debate’s participants. Oh, and PBS's in-house commentators, who chimed in at halftime on how the debate was going, were all women as well. Rock on. PBS also deserves credit for its live-stream, which it provided in cooperation with YouTube. It was both free — always a plus — and, from a technical standpoint, super reliable and pristine. This is rare. In fact, I can't remember the last debate that I live-streamed that didn't glitch out throughout the night. But when I was watching the PBS debate, the screen only froze once, and it was immediately fixed by a refresh of the browser. The image was clear and crisp, and the audio sounded great. Whatever PBS and YouTube did to make this so smooth, they succeeded. Now, onto the actual substance. Moderators Gwen Ifill and Judy Woodruff didn't try to goad Clinton and Sanders into attacking one another, and they didn't lob softballs, either. Instead, they asked incisive and thoughtful questions, and they clearly did this with the goal of getting helpful and relevant answers from the candidates. They succeeded. For example, Woodruff asked Sanders whether he'd go beyond President Obama's executive orders on immigration. This is a good question: While Republicans think these executive orders are outrageous, a whole lot of immigration activists that they don't go nearly far enough. Those activists form a significant part of the Democratic base, as do many immigrants themselves, and so it's worth asking the Democratic candidates not whether the orders go too far, but whether they go far enough. By formulating the question the way she did, Woodruff ensured that it would directly address the concerns of Democratic voters. A lesser moderator would have simply asked if Sanders agreed with Obama's executive orders, which would elicit a quick "yes" and nothing much else. But Woodruff's question got two helpful responses from Sanders. First, he said flatly that he "would go further" than Obama. Then, he noted that he disagreed with Obama's record on deportations. If you're a Democrat, this is exactly what you want out of a Democratic debate: hard questions that produce firm, unambiguous, on-the-record responses from the candidates. Candidates are stronger when they're forced to take solid positions, and the whole night had moments like this. Consider, for example, when the candidates were asked how they'd work to end the mass incarceration of black Americans. This prompted a long list of very specific policy proposals from Sanders: demilitarization of local police forces, ensuring that the racial makeup of police departments reflects the communities they serve, stronger penalties for cops who break the law, and others. When he was done talking, Clinton added a couple of more proposals to the pile, like mandatory sentencing reforms, and then pointed out that systemic racism extends beyond just the criminal justice system. Both candidates stated that they agreed with one another on all of these points, and the audience applauded wildly. What this debate confirmed, then, is that the Democratic Party intends to zealously support (or co-opt, depending on how you look at it) the #BlackLivesMatter movement. Whether Democrats succeed in enacting legitimate and meaningful reforms is a whole other question entirely, of course, but this debate helped confirm that the party will indeed position itself as the anti-systemic racism party for the foreseeable future. That's rather huge, and even six months ago, it wasn't clear that the party would take this stance. This debate wasn't as flashy as the extravagant productions that, say, Fox News or CNN put on for the last few debates. But even this made for a better night: The focus was on the candidates, and the candidates alone. There was no showy camera work or movie trailer-style introductions of Clinton and Sanders. it was just two candidates talking on a stage. In totality, this was everything political debates should be but usually aren't. The networks should take some serious notes, because PBS — a nonprofit that's partially funded by the government — put all of them to shame tonight.